Smart energy management has never been easier than with the VT8300 series Fan Coil Room Controllers. Designed for new construction and retrofit projects, the Room Controllers dramatically decrease project delivery costs by reducing installation, configuration and commissioning time. No complex software or tools are required to customize functionality in order to meet your applications requirements. The Room Controllers provide all the advanced features and monitoring functions required by modern building automation systems in a simple compact enclosure. Smart energy management has never been easier than with the VT8600 Room Controllers for Rooftop Units, Indoor Air Quality, and Heat Pump applications. Designed for new construction and retrofit projects, the Room Controllers dramatically decrease project delivery costs by reducing installation, configuration and commissioning time. No complex software or tools are required to customize functionality to meet your applications requirements. The Room Controllers provide all the advanced features and monitoring functions required by modern building automation systems in a simple compact enclosure. 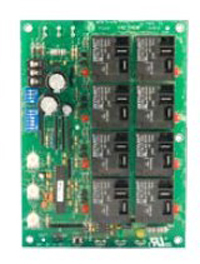 This two component retrofit option consists of the VTR8300 room controller and the VC3000 relay pack. Together, they provide an easy solution for retrofitting fan coil unit thermostats without requiring other components such as relays, transformers, controllers, sensors, and network wiring to be upgraded. Existing line voltage wiring between the fan coil unit and room controller can be reused to further minimize overall labor and installation costs for both retrofit and new construction control projects. Additional flexibility and energy savings can be achieved with optional wireless door and window switches. The VT7200C5000 series features a backlit LCD display with dedicated function menu keys for simple operation. Accurate temperature control is achieved due to the product’s PI proportional control algorithm. Models are available for 3 point floating (can be set for On/Off). In addition, remote room sensing is available. All models contain an auxiliary contact that can be used to control lighting or auxiliary reheat. All devices are also available with Echelon, BACnet MS-TP or wireless network adapter. The VT7200F5000 series features a backlit LCD display with dedicated function menu keys for simple operation. Accurate temperature control is achieved due to the product’s PI proportional control algorithm. 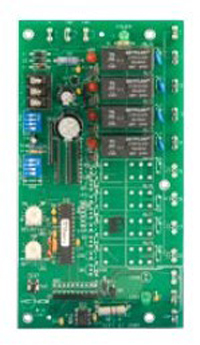 Models are available for analog 0-10Vdc control. In addition remote room sensing is available. All models contain an auxiliary contact that can be used to control lighting or auxiliary reheat. All devices are also available with Echelon, BACnet MS-TP or wireless network adapter. The VT73xxC5000 PI thermostat family is specifically designed for fancoil control. The product features a backlit LCD display with dedicated function menu buttons for simple operation. Accurate temperature control is achieved due to the product’s PI proportional control algorithm, which virtually eliminates temperature offset associated with traditional, differential-based thermostats. All models can control three, two or single fan speeds. Three additional inputs are also provided for various functions. All models feature configurable System and Fan button functions to meet all possible applications. All models contain an auxiliary contact that can be used to control lighting or auxiliary reheat. All devices are also available with Echelon or BACnet MS-TP network adapter. The VT73xxF5000 PI thermostat family is specifically designed for fancoil control. The product features a backlit LCD display with dedicated function menu buttons for simple operation. Accurate temperature control is achieved due to the product’s PI proportional control algorithm, which virtually eliminates temperature offset associated with traditional, differential-based thermostats. All models can control three, two or single fan speed. Three additional inputs are also provided for various functions. All models feature configurable System and Fan button functions to meet all possible applications. All models contain an auxiliary contact that can be used to control lighting or auxiliary reheat. All devices are also available with Echelon or BACnet MS-TP network adapter. The VT76xxA/VT76xxB PI thermostat family is specifically designed for single stage and multi-stage control of heating/cooling equipment such as rooftop and self-contained units. The product features an intuitive, menu-driven, back-lit LCD display which walks users through the programming steps, making the process extremely simple. All models contain two digital inputs, which can be set by the user to monitor filter status, change the occupancy status, and/or used as a general purpose service indicator. In addition, depending on the model, up to three remote sensor inputs are available. All models contain a discharge air sensor input and SPST auxiliary switch, which can be used to control lighting or disable the economizer function. The VT7600H PI thermostat family is specifically designed for multi-stage control of heating/cooling equipment such as heat pumps and self-contained units. The product features an intuitive, menu-driven, back-lit LCD display which walks users through the programming steps, making the process extremely simple. All models contain two digital inputs, which can be set by the user to monitor filter status, change the occupancy status, and/or used as a general purpose service indicator. In addition, depending on the model, up to three remote sensor inputs are available. The VT76x7 PI thermostat family is specifically designed for single stage and multistage control of heating/cooling equipment such as rooftop and self-contained units with humidifier and/or dehumidifier. The product features an embedded complete humidity solution with an intuitive, menu-driven, backlit LCD display that walks users through the programming steps, making the process extremely simple. All models contain one digital input, which can be set by the user to monitor filter status, change the occupancy status, and/or used as a general purpose service indicator. The two models contain SPST auxiliary switch, which can be used to control lighting and a discharge air sensor input. 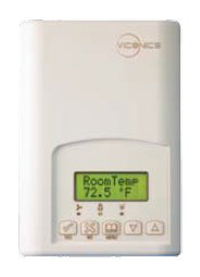 The Viconics VZ7260 PI thermostat family is specifically designed for local pressure dependent VAV zone control within Viconics Zoning System product family. The product features a backlit LCD display with dedicated function menu buttons for simple user operation. Accurate temperature control is achieved due to the product’s PI proportional control algorithm, which virtually eliminates temperature offset associated with traditional, differential-based thermostats. The thermostats are used in conjunction with the Viconics VZ7656 Roof Top Controller thermostat for total system operation of each zones and the RTU. A local BACnet MS_TP communication bus between all devices insures proper communication and smooth data exchange of all required information between the Zones and the RTUs for proper system operation. As such, it can be seamlessly integrated into any 3rd party BACnet® supervision system. 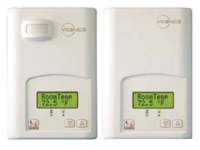 The Viconics VZ7656 thermostat is specifically designed for RTU control of the Viconics Zoning System product family. The RTU thermostat is designed for single stage or multi-stage control of heating and cooling equipment such as rooftop and self-contained units used in zoning systems. The product features a backlit LCD display with dedicated function menu buttons for simple user operation. Accurate temperature control is achieved due to the product’s PI proportional control algorithm, which virtually eliminates temperature offset associated with traditional, differential-based thermostats. The thermostat also contains extra digital inputs, which can be set by the user to monitor filter status or used as a general purpose service indicator. All models contain a SPST auxiliary switch, which can be used to control lighting or disable the RTU economizer function during unoccupied periods. It also features a discharge air sensor input. Proportional static pressure logic (input and output) has been integrated onto the thermostat to provide a complete single packaged unit for most small to medium size jobs. 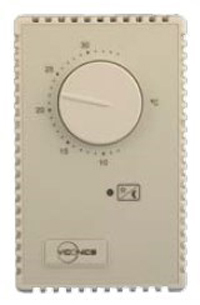 The T901 series proportional thermostats are microcomputer based, proportional and integral (PI) devices with one contact time proportioning output. They can be used with most relays and actuators that are compatible with on/off control signals. The thermostats also contain two dip switches to choose the location of the remote sensor (internal, external) and between direct and reverse acting modes. Some models have a day/night input, an override button and a night mode led mounted on the thermostat cover. The T920 series thermostats are microcomputer-based, proportional and integral (PI) devices with one analog 0 to 10 Vdc output. They can be used with most control devices in the HVAC industry that are compatible with this signal. A typical application would be to control an analog VAV or valve actuator. Thi thermostat also contains three dip switches to choose the application (room or supply air control), the location of the main sensor (internal, remote) and between direct and reverse acting modes. Some models have a day/night input, an override button and a night mode LED mounted on the thermostat cover. The T921 series thermostats are microcomputer-based, proportional and integral (PI) devices with one analog 0 to 10 Vdc output & one contact output. 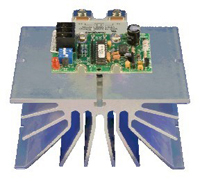 They can be used with most controlled devices in the HVAC industry that are compatible with those signals. The thermostats also contain 4 dip switches to choose the application type (heating, cooling), the deadband value (2°F, 4°F), changeover configuration and contact output configuration. Some models have a day/night input, an override button and a night mode LED mounted on the thermostat cover. 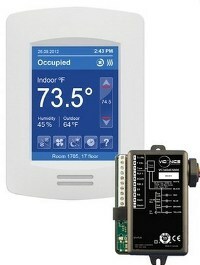 The T926 series thermostats are microcomputer-based, proportional and integral (PI) devices with two analog 0 to 10 Vdc outputs. 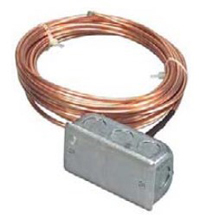 They can be used with most control devices in the HVAC industry that are compatible with the above mentioned signals. The thermostats also contain four dip switches to choose the application type (heating, cooling), the location of the main sensor (internal, duct), the changeover configuration of analog output #1 and the deadband value. Some models have a day/night input, an override button and a night mode LED mounted on the thermostat cover. 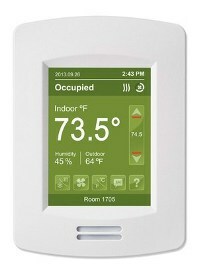 The T950 series thermostats are microcomputer-based, proportional and integral (PI) devices with one floating (incremental) output. It can be used with most controlled devices in the HVAC industry that are compatible with this signal. The thermostats also contain three dip switches to choose the controlled device (VAV, valve), the actuator timing range for full stroke and the chageover configuration of the floating output. Some models have a day/night input, an override button and a night mode LED mounted on the thermostat cover. 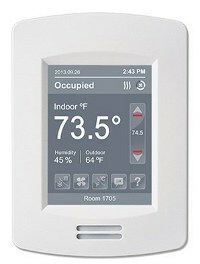 The T951 series thermostats are microcomputer-based, proportional and integral (PI) devices with one floating (incremental) output & one contact output. It can be used with most control devices in the HVAC industry that are compatible with those signals. The thermostats also contain five dip switches to choose the application type (valve, VAV), the actuator timing range for full stroke, the changeover configuration of the floating output, the deadband (2 °F, 4 °F) and the configuration of the contact output. Some models have a day/night input, an override button and a night mode LED mounted on the thermostat cover. The VH7200 humidity controller family is specifically designed for control of humidification and dehumidification equipment such as, steam header direct injection, desiccant wheel, or stand alone humidification / dehumidification equipment. The product features a complete embedded humidity control solution with an intuitive backlit LCD display that walks the installer through the configuration steps, making the process extremely simple. 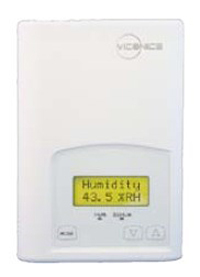 Accurate relative humidity control is achieved via the product’s unique PI time proportional control algorithm, which virtually eliminates humidity offset associated with traditional, differential-based humidity controllers. All models contain a binary input, which can be set by the user to monitor an electrode humidifier canister service status or may be used as a general purpose service indicator. Models are available with more advanced features such as discharge humidity proportional high limit and indoor humidity setpoint reset based upon outdoor air temperature to conserve energy and eliminate condensation on windows and structure. The Viconics R810 series power switching modules are designed for cost effective, precise modulation of electric loads for most electric heating applications (Applicable on resistive loads only). 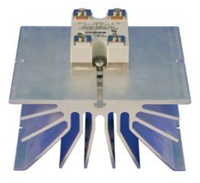 The R810 series consists of SSR’s ( solid state relays ), c/w factory assembled heatsink for surface or in-panel mounting. The R820 series consists of SCR’s power controls, complete with factory assembled heatsink for surface or in-panel mounting. The R820 power controller also contain four dip switches to adjust the control signals. The Viconics R850V series step controller is designed for cost effective, precise modulation of multistage control application. An integrated vernier control output will give a precise and full modulation of the load from 0 to 100% of the total capacity. The Viconics R851B/R851V series step controller is designed for cost effective, precise modulation of multi-stage control application. A common application is a multi step electric boiler. The S1010E1000 sensor is a capsule type sensor for multi-purpose use. The S1010E1000 is easy to dissimulate for indoor and outdoor use. The capsule has a ¼” diameter. The sensor comes with 65 inch leads. This sensor is also used for water temperature sensing strapped a pipe or in an immersion well. The S1010D1000 sensor is used for changeover purposes with the VT7000 series. This sensor is mounted to the duct for air temperature sensing. The S2000D1000 sensor is used for duct temperature sensing. The sensor is mounted on the return air duct to measure the return air temperature or on the fresh air duct to measure the outside air temperature. The S2060A1000 series duct sensor is used to average a duct’s air temperature. To attain the average outside air temperature, the sensor must be mounted in the fresh air plenum. For economizer models, the sensor can be placed in the mixed air plenum to average mixed air temperature. The S2020E1000 sensor is used for outside air temperature sensing with the sensor installed directly exposed to the elements. 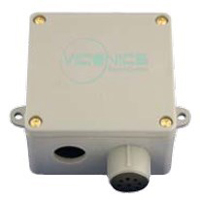 This sensor uses a water resistant NEMA 4 PVC enclosure for outdoor applications.